Early American plates are issued for use on collectable vehicles at least 20 years old. (Formerly the vehicle needed to be at least 25 years old) The name of this type worked out pretty well up until around the mid-1990s, at which time it was about 25 years after foreign cars started being imported in any great number. Now we have "Early American" plates appearing on foreign cars. As of March 29, 2014, new plates of this type are no longer issued. Instead, bland blue-and-white "Classic Vehicle" plates are issued- without the familiar antique car graphic. Existing E/A registraions will continue to be renewed. 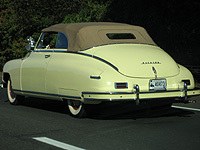 In 1951, there were a small number of "Historical Auto" plates used. I'm not sure if these were actually official registrations, or were for display only. The earliest of the "Early American" plates were issued in 1952. These were porcelain plates, black on a white background. Date tabs were initially used to validate these plates in the same manner as regular passenger car plates, later on decals were used. This style of plate made it somewhere past the number 1500s. Once they ran out of these porcelain plates around 1960, flat screened plates of a similar style were issued. Over the next 30 years or so, there were numerous variations of these plates, mostly with font styles and sizes. Eventually the plates were made with embossed numbers, and with the general-reissue in 2000 reflective plates were issued. These plates now have the "Early American" legend spelled out rather than using the stacked E/A. Interestingly, notice in the pictures below how with each successive variation the picture of the car gets just a bit smaller! In late 2011 number 99999 was reached. A new format was started: 1A-234. Once the '1A's were finished, the series moved to 1B-234, etc. The "Classic Vehicle" plates continued in this format where the "Early American" series left off until late 2015. At this time an incoherent numbering format of 01-ABCD was introduced. The first plates began with "00" followed by 4 letters, it appears the letters are progressing before the numbers will move to "01". This numbering format is shared with Motorcycle plates. Connecticut also has a "Year of Manufacture" program, where classic car owners can display plates from the year of the vehicle's manufacture. First, however, the car must be registered with Early American plates, which must remain in the vehicle at all times. This program hasn't been as popular as it is in other states, and it's not too common to see classic cars on the roads with anything other than Early American plates. Early American Motorcycle plates are also issued, see below. (MJB Collection) The first E/A plates were black on white porcelain over an iron or steel base. These were issued up to just past number 1500 E/A. This plate was a flea market find - not too bad. The numbers got a lot skinnier when they reached 4 digits. By this time decals were used for the expiration date; tabs weren't used this far into the series. After the porcelain plates were all issued, the design changed to flat painted plates, such as is shown here. ca. mid-late 1980s 3-digit plate. A batch of these recently turned up; I'm not sure whether these were supposed to be replacements for the original low-number porcelains, or just a batch of low-number plates made up which were never actually issued. ca. late 1980s/1990s with Replacement Decal. This is a non-reflective embossed plate. ca. 2001 with Replacement Decal. Note that the E/A was dropped in favor of the 'Early American' Legend on the bottom. I'm not sure why even brand-new Early American plates were issued replacement decals and replaced during the general re-issue. I have seen more than one instance of this. Early American plates were one of the very last types to receive plate validation decals. These two plates show how the numbering progressed - the '1' stayed constant while the last 3 numbers increased, then the letter increased. Eventually the '1' moved up to '2' on the Classic Vehicle plates. As of April 1, 2014, "Classic Motorcycle" plates are issued in place of the E.A. Motorcycle type. Unlike the "Classic Vehicle" type for autos, these plates still feature a graphic.